We had a 10 p.m. flight back to Los Angeles, so we didn't have time to do a tasting menu. 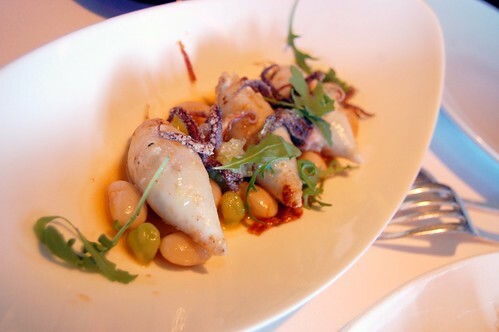 But we did have time for a glorious fast meal at Boulevard, a Michelin-starred and James Beard Award-winning restaurant. 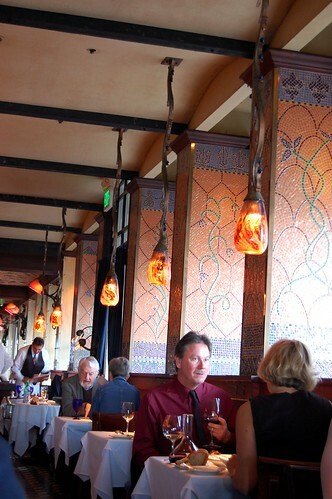 The decor is a bit dated, but the place is warm and welcoming, and you won't be totally out of place if you wear dark rinse jeans and a sweater. Mr. Monkey was delighted that the extent of his dressing up for dinner was wearing nice leather shoes. 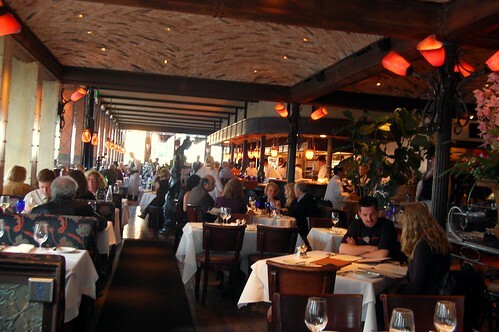 When making our reservation, we noted that we were on a tight schedule. Boulevard was most accommodating. Our server tended to us cordially but also made sure that we were in an out in a flash as we'd requested. Now this is not how I typically enjoy dining. I'm a total lollygagger when it comes to my meals, always the last to finish. If you've eaten with me, you may have noticed this. I'm not sure if it's because I'm carefully savoring every bite or if I'm just a naturally slow eater. It's probably the latter, but I'll pretend it's the former. Not Mr. Monkey. He can hoover up a plate in seconds. 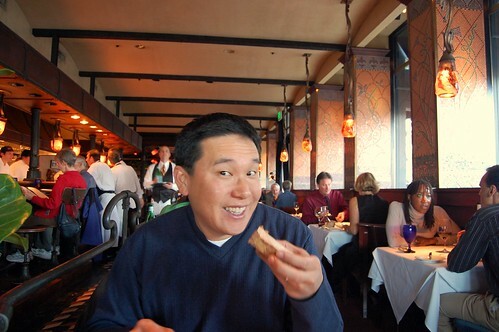 And, after our meal at Boulevard, he said, "We should say we're in a rush at every meal! This was great!" Silly boy. But he was right about one thing -- Boulevard was indeed great, even if we sped through three courses in just a little over an hour. At this point in the post, I must make an embarrassing confession. The descriptions of these dishes won't be perfect because, in my haste during this meal, I failed to photograph the ever-changing menu. 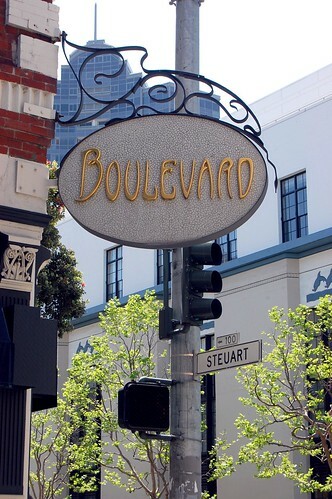 I also don't recall specific prices, but you can peruse the Boulevard website for a general idea. Apologies. I do, however, have a knack for remembering good meals, so let's give this a shot. Glazed Duroc pork belly and slow-roasted black cod with sherry, aged sherry vinegar, baby potatoes, black garlic, and applewood essence. 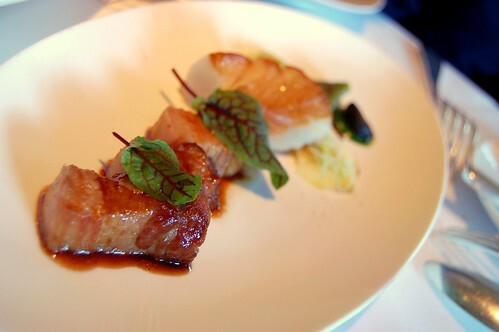 While the pork belly was rich and luscious, we were surprised that the black cod stole the show with its mild but clean flavor and delicate texture. 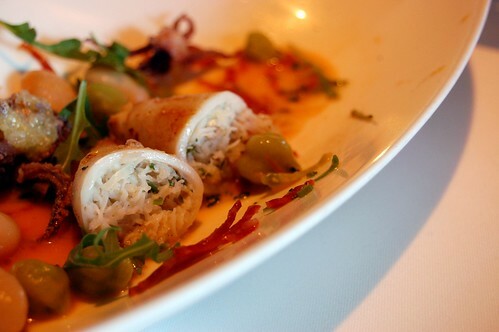 Monterey calamari stuffed with Dungeness crab with Italian butter beans, chorizo, and Meyer lemon relish. I really wanted to love this, but it fell slightly short of love. I was in pretty deep like, though. What's not to like about a delicious sea creature stuffed with another delicious sea creature? One more stuffed sea creature, and this would've been an aquatic turducken. Too bad the crab wasn't as flavorful as I'd hoped it would be. 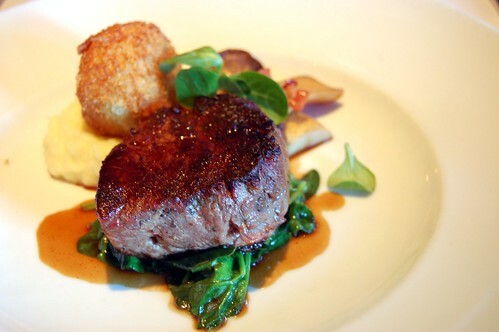 Wood-oven-roasted Angus filet mignon on wilted spinach with chanterelles, crispy pancetta, and potato croquette. Mr. Monkey went nuts for this. I agreed that it was tender, juicy, and wonderful. He proclaimed it was perfect. 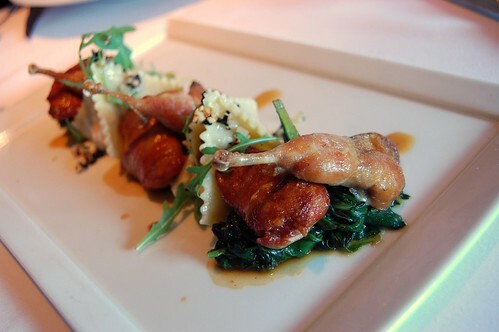 Cavendish Vermont quail breast wrapped in pancetta and slow-roasted leg, pyramid ravioli with bolognese and polenta fondue, braised kale with garlic and pepper flakes, toasted pine nuts, parmesan relish, and roasted quail jus. You know me and my penchant for tiny food. The tinier, the cuter, the better. I love tiny fowl. I love quail. I loved this quail. The ravioli didn't impress me that much, but I had the best time eating every little morsel of this minuscule bird. Perfectly browned. Perfectly seasoned. Perfectly tiny. 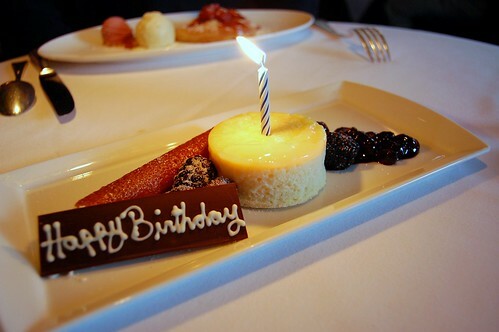 Yes, this was my fourth birthday meal in April. Don't you know I celebrate all month? Stop looking at me in that tone of voice. This dessert was a mouth-puckering delight. 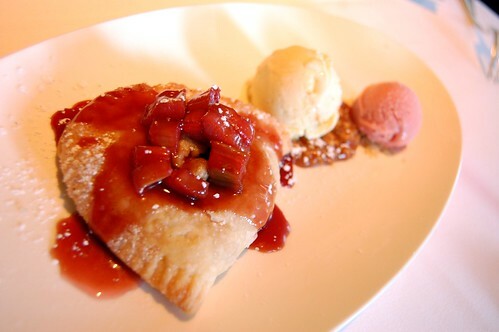 Fried strawberry and rhubarb pie with fresh sorbet. It's fried. There are strawberries. And glaze. What more could you ask for? This concludes our late April trip to San Francisco. Thanks for tuning in. Huzzah! I know that was abrupt. Just be happy I'm posting again. this was you "winging it" with the descriptions? I hate dressing up for dinner too. The dinner looks fab. What a lucky bday girl you are. This made me extremely excited for my meal at Boulevard in 2.5 weeks. Don't forget the rhubarb! I would never look at you in that tone of voice. Best description of seafood EVER. oh yum. i love the "aquatic turducken," too. I read every word and didn't mind the abruptness. Not one bit. p.s. love the blog titles, especially "nutso ordinary" and the "peanut gallery" - you're brilliant! Yum! (even though I don't know what some of the things are, they still look good). I am with Mr. Monkey. I am a food hoover.